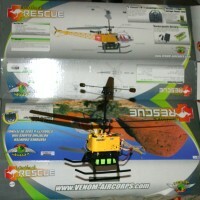 The predator is a relatively expensive balsa and solar film model by rctoys in Canada. I bought it because it was advertised as a good camera platform. I did contact an Australian supplier or two first but they had no advice on suitable models. I bought the endurance kit (Lithium Poly battery) and wireless video camera bundle (eyecam). Ready for first test flight. Note the shortness of the tail. Un-powered throw. The prop is tiny. Believe it or not this is the takeoff. It was thrown but mowed the grass before climbing out. Power is marginal. Things did not go well. My experienced test pilot lost control. 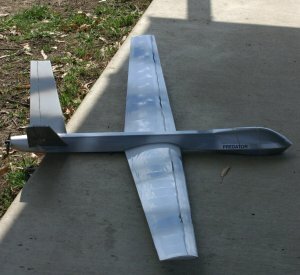 Once repaired I flew and crashed it as well, no damage to speak of that time. I put it away and bought a cheaper mass produced model to learn on and I think it will actually do the job I bought the predator for. 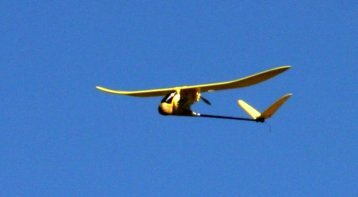 The aerobird should be a reasonable camera platform. At $250 aus it is a fraction of the price of the predator. Unfortunately I was very disappointed to find it had the most stupid transmitter layout I can imagine. 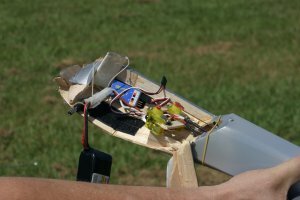 One stick controlled pitch (elevator) and another controlled yaw (rudder) with throttle on the back. This is different to the manual and the video. I was told this was because it is the Australian model (29MHz). Why they changed the configuration for us beats me. The first attempt to fly it was a disaster. 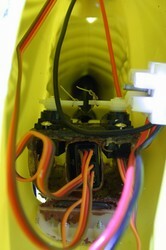 First a weak plastic control horn broken while I was adjusting the rubber band which pulls the controls down. I made a temporary repair and ended up with the controls mis-adjusted. After several nose dives into the ground and a broken tail I ordered a proper six channel remote plus the servos and ESC (electronic speed controller). This all cost more than the whole plane did. Unpacking the new transmitter I was again disappointed. The sticks were reversed to what I wanted. I had assumed a “computer” transmitter would get you selected which stick does what but no, virtually everything else is reconfigurable but I had to physically rewire it and swap the friction mechanism with the springs. I now have 3 remotes. Only the predator was configured to my liking and the other two did not match the manuals. Get it right guys, fix the software to let us choose. If I didn't have a V tail it would have been easy to fudge it, but as the mixing happens in the transmitter it isn't just a matter of plugging the servos into different channels. 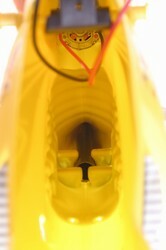 Also the aerobird doesn't have a standard receiver – you can't use it with a different transmitter. Above is the old receiver. 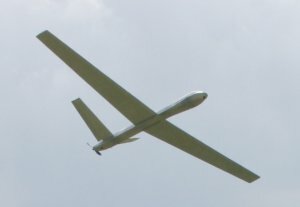 The empty body with motor visible. New servos and receiver, ESC is on the motor. I had everything ready for Easter (05). Every launch was a success but I still had a few crashes. 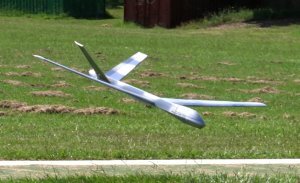 On the first flight (and crash) the tail was damaged. The bottom of a horn broke and the tail was badly creased. I didn't have a spare so I glued the horn together and used a pair of Stanley knife blades to repair the tail. This lasted the weekend. Here is a short video (2.8meg) of the first successful flight (and landing). The flight was several minutes long, this is just the launch and landing. Now a veteran with 10 minutes flying time I decided to risk putting the eyecam on the plane. This is the last minute of the flight (11 meg file). It is a humble proof of concept. Next I will buy some better gear and hopefully set up for RPV (remote pilot view). My first RPV didn't go well. There were a series of problems. My new receiver was not compatible with the eyecam so I ended up tied to the DVD recorder. I intended two use two receivers, one for RPV and one to record. This way I could go where I had a good view of the area and I could turn and walk around. I used eyetop goggles and the image I was seeing was very poor – I blame the camera more than the display. In the end I hit a tree I didn't even see. The last 30 seconds can be seen here. 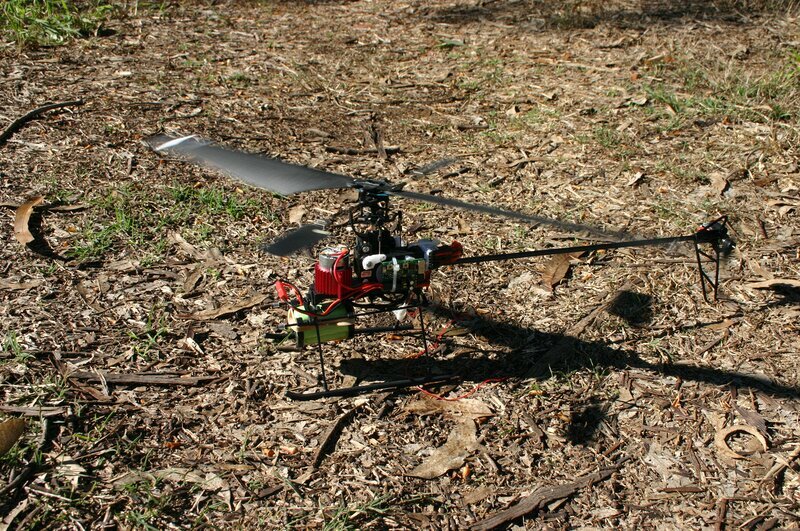 Then quite unexpectedly I bought a micro helicopter, a GWS dragonfly, bad move. 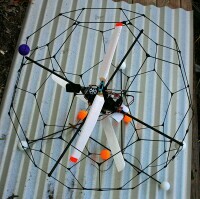 The thing didn't arrive for a month and when it did it was un-flyable because of a problem with the tail gyro. This had a pha-01, three in one board and all the bad things people say about it are true. I decided to “go separates” and fitted a ms-044 heading hold gryo and two jeti-12 ESCs, bad move. The gryo couldn't be tamed enough to give a stable tail. 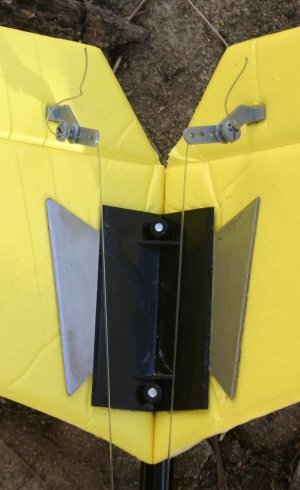 It is intended for a variable pitch tail not an electric one. 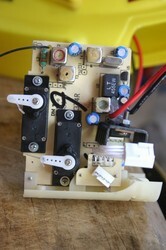 I ordered a TREC (tail rotor electronic controller) from dionysusdesign.com, probably a good move. 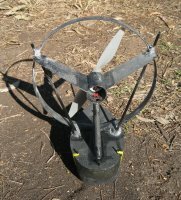 I'm not sure how well the TREC works because before I fitted it I broke the tail prop. I couldn't get the proper prop at short notice (still waiting for one) so I bought some small micro-flier props and this fixed the tail problem. I think it will be best to use the correct prop and tame it with the TREC. The TREC had a software bug and once I disabled the safe-start feature I was unable to connect to it (it has a USB adaptor) to reconfigure it. Fortunately Dan from dionysus design had a work-around which eventually let me access it again – that bug should be fixed by now. So some two months after ordering the heli - I can try to learn to fly it. I've only been at it a week and it seems possible. Mechanically the DF seems fine for what it is, its a cheap trainer. If it can be made to do more that will be a bonus. I was hoping to fly this indoors for practice. This is just possible with something like the DF, I wouldn't be game to try it with anything larger. 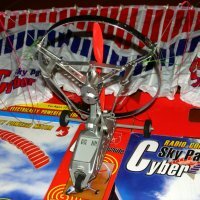 For indoor toys the blade-runner and x-ufo look pretty good. The former is strictly a toy, at 50 grams it can't carry a camera. 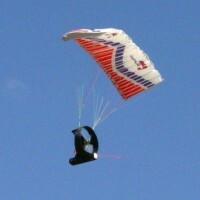 The x-ufo is similar weight to the DF and should be able to carry at least an eyecam.